I’ll admit it. Pretty much the only way to get me to go to a movie, concert, Shabbat, what have you – is a Whatsapp message from a friend saying “I’m going to this, wanna come with me?” Or me finding some new shenanigans but making sure to find a buddy to come with me before I sign up. I don’t think it’s just me. You can check your own recent texts, or see the latest influencer post on Instagram, to confirm. It’s a habit of many of us, a way of life for our generation. Which is why when I go to new places or experiences, and I meet people who came alone – without their friends as security blankets – I’m so impressed. These are people who put themselves out there time after time. These are the people that say ‘I like to meet new people’ and actually mean it. Every year, when we give out Camper awards at the end of Camp Nai Nai Nai, the award for “Most Courageous”/”Braveheart”/”Most Like Mel Gibson in Braveheart, but nothing like him in real life” goes to campers who came without knowing anyone else there; who didn’t come with their bestie or their SO or their group of friends, but who took the leap into the unknown and came all by themselves. THAT is true bravery! Perhaps what is meant is the fear of the unknown, fear of rejection, fear of loneliness or social anxiety. Maybe the one who is brave is one who goes to a social event, or a four day immersive camp weekend, without knowing a single other person there. Ask yourself – would you do that? When was the last time you did? So often when we’re faced with this possibility we decide to pass on it and just stay home instead. But on the rare occasion that we conquer our fears, the rewards are invaluable. At Camp Nai Nai Nai we design the program with these brave souls in mind. Every camper has his/her own mishpacha group (a small group of campers with a dedicated camp counselor) where you begin to get to know fellow campers and meet throughout the weekend. The very first evening, camp-wide ice breaker games help you get a sense of who’s who at camp. 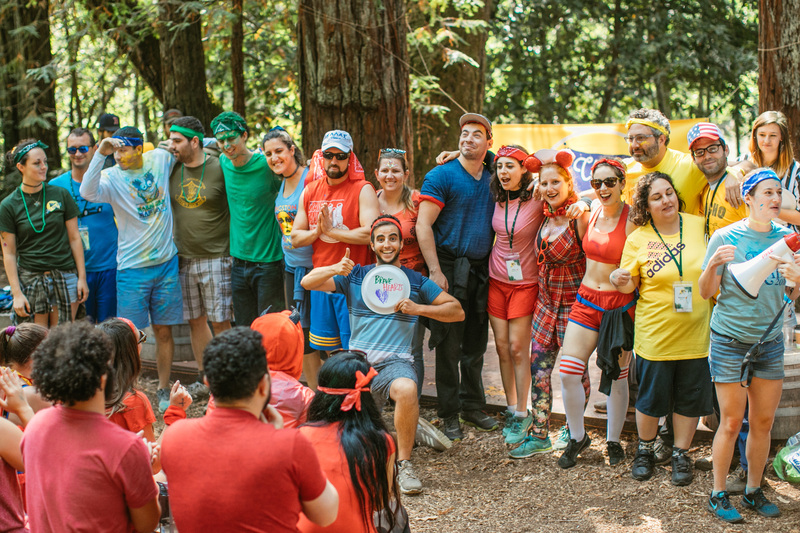 Every Playshop (there’s no “work” at camp) is an opportunity to meet like-minded folks based on your interests, whether it’s art, science, dance, improv, or dodge ball. Coming back to your bunk cabin, you have 8-10 roommates waiting to chat. Be brave. Try something new. Meet new people. You won’t regret it. And you might even win a Braveheart paper plate award.